For more than 35 years, Harold Rotzoll has been creating black-and-white etchings with subjects ranging from amusing animals to musings on the meaning of life. 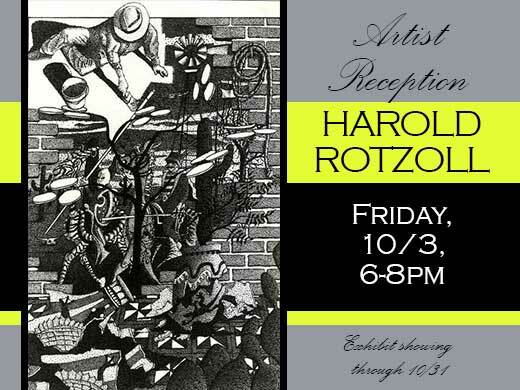 A life-long Janesville resident, Rotzoll received a BA in art from UW-Whitewater with a concentration on printmaking. His work appears in the collections of universities, galleries, art centers, and private owners. Harold’s etchings have been shown in local, national, and international art exhibitions, and he has received numerous awards. He also judges both local and national art competitions, and creates commissioned work for public, private, and corporate venues.